There is a roofing system engineered to last the life of your building. 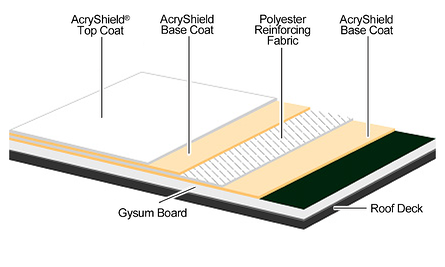 AcryShield® SPF Roofing Systems do not degrade like other roofs. The redundant waterproofing from long-lasting sprayed polyurethane foam (SPF roof) and high-performance acrylic roof coating also eliminates UV attack and deterioration. Roof performance properties in year 15 are equivalent to the initial installation. Consider the National Roofing Foundation’s comprehensive SPF sprayed polyurethane foam roof study where Dr. Rene M. Dupuis of Structural Research, Inc. concludes, "The field data…demonstrates that SPF roof systems provide long term performance and sustainability." Achieve big boosts in your R-value with this fully-adhered, seamless, waterproofing system that has outstanding impact strength. Eliminate the most challenging problem of ponding water by custom tapering your roof as it is applied. All our AcryShield SPF Roofing Systems offer excellent value. 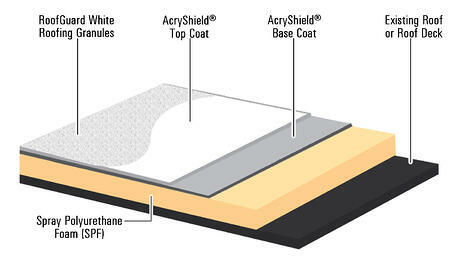 A SPF roof lasts for decades and may meet Factory Mutual and UL standards. Sustainable-easily renewed for the life of the building. Guaranteed for up to 20 years. Reflects the sun’s damaging heat and UV rays. Protects and insulates your building. Reduces energy bills up to 30% with short pay-back periods. Installs over existing roofs avoiding expensive and time-consuming tear-offs. Simplifies roof details and improves waterproofing performance. Self-flashes for a seamless one-inch minimum layer of roofing protection. Need technology-driven new Cool roof products providing an industry leading, Class A UL Roofing assembly? Consider our high performance reinforced, fully-adhered and seamless AcryPly®-D Elastomeric Roof Coating Systems. With these systems you benefit from the latest product and installation advances in water-based coatings that includes a composite board with or without polyiso insulation and a seamless, fully reinforced Cool Roof elastomeric membrane. You can custom-reinforce your roof for extra toughness under adverse service conditions, and you benefit from long-term warranty options and the added confidence of using qualified professional applicators. Durable roof waterproofing and weatherproofing. An Elastomeric roof coating is much more resistant than traditional roofing to general chemical attack from precipitation and vent emissions. Total UV blocking. Protects against the main cause of roof leaks and failure. Superior reinforcement versus traditional built-up (BUR) and single ply roofing. Economical- Ease of installation=Less Labor. Exceptional fire and thermal barrier-UL Approved. Superior Leak Free Roof Waterproofing and Excellent insulation R-Values. Highest per inch Long-Term Thermal Resistance (LTTR) values. No irritating and unpleasant odors. No dangerous 500°F hot asphalt or torches -- Only environmentally-friendly water-based systems. Crews achieve much higher productivity versus installing other roof products. Your money goes into safe, "sustainable technology" materials, not excess labor. An elastomeric roof coating is the latest in highly reflective acrylic roof coating technology-Saves Energy. Advanced chemistry resistant to dirt pickup. Reflectivity up to three times greater than dark BUR, EPDM, and ModBit roofing, means large energy savings for fast paybacks on roof investments. Keeps heat off your roof, reducing membrane stress and heat-accelerated degradation. Sustainable Building & LEED Credits. 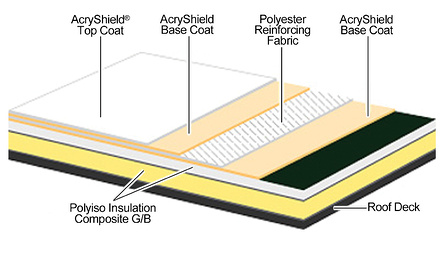 Available with or without polyiso insulation. No inconvenience to occupants during application. Installation can be phased based on your highest priority problem areas and budget constraints. The SRC Silicone Roof Coating systems provide a "green" approach to coating your roof. These systems contains high solids, low VOC's, while offering a one-component, moisture-curing silicone roof coating system to restore and repair your existing roof. With its high solids content and absence of hydrocarbon solvents, this coating can be applied in excess of 40 mils in a single coat without blistering, while maintaining maximum adhesion. System application eliminates the need for tear-off and disposal. Keeps the building interior safe from the elements during re-roofing. Fewer toxic emissions during installation. Reduces energy costs by reflecting sunlight and radiant heat – keeping the roof surface cooler. Proprietary formulation eliminates the use of primers, in most instances, providing superior coating adhesion. Silicone is durable in extreme weather conditions and moderate ponding water. Extends the life of your existing roof: concrete, modified bitumen, single-ply, metal roof panel, and smooth BUR. Significantly lowers labor and materials costs. Seamless systems reduce your ongoing maintenance costs.